Today is the official first day of Summer (yay!!! ), and already I've heard of several cases of sunburn, on Facebook alone! I myself was caught off-guard by unexpected sunshine last weekend and have a bit of a sunburned shoulder. Luckily, I didn't suffer long! And neither will you, if you follow my tips for sunburn rescue! So, while prevention is always the best cure, things don't always work out perfectly. And when they don't, you've gotta keep a smile on your face and go with plan B! Lavender Essential Oil - a Summer Staple! Lavender essential oil really is amazing for any kind of burn! It will ease the pain, heal the skin faster, and prevent scarring. It also helps unhealthy skin cells die off instead of mutating into cancer cells (healthy cell renewal). Good stuff! Lavender EO can be applied neat (undiluted) for most individuals. The simplest way to use Lavender is to apply it directly to the burn using a cotton ball. Continue reading for more ways to use this summer staple! Fill a spray bottle with about 10-20 drops of Lavender essential oil and 1/2 cup of water ( I like distilled, but tap water will do). Shake well before each use and spray the affected area. This is very soothing and cooling. You can substitute the water for Aloe Vera juice, but be sure to keep it refrigerated. Oatmeal is very healing and soothing. It holds moisture and has a high silica content, making it an ideal skin soother. A lavender and oatmeal bath soothes dry, itchy or irritated skin. Lavender and oatmeal baths are perfect for children with mild sunburn. Grind 2-4 cups of dry oats into a fine powder using a blender. Add to lukewarm bath water along with 10 drops of lavender essential oil. Soak for 15-30 minutes. Gently pat dry. The oatmeal will form a thin, protective layer on the skin. (Don't wash off). If your sunburn is only on a small area of your body, you can use a lavender & oatmeal paste instead of a bath. Add 5 drops of lavender essential oil to 1 cup of finely ground oats. Add enough water or aloe juice to create a paste. Apply to sunburn and leave for 15 minutes. Remove gently with a wet washcloth, or rinse off over a sink and pat dry. Afterward, apply a layer of lavender essential oil using a cotton ball. Peppermint essential oil is known for it's cooling properties and is also anti-inflammatory (as well as anti-carcinogenic). Fill a sink or basin with cool water. Add 5 drops of peppermint essential oil to the water. The essential oil will float on top of the water. Place a clean washcloth on top of the water and let it soak up the infusion. Wring out and apply to the burn. Repeat several times (without adding additional essential oil). To prevent blistering and peeling, apply apple cider vinegar to the burn with a cotton ball. I prefer Bragg's Apple Cider Vinegar with the mother, which can be found inexpensively at your local health food store. 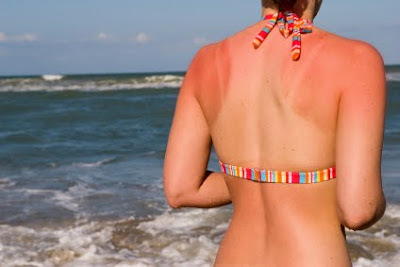 So, the next time outdoor activities result in an unwelcome sunburn, you can smile and say..."I have a cure for that!!" Have a GREAT summer!!! PS - My Lavender Olive Oil Lotion, or Lavender Baby Lotion are both wonderful for sunburns, as is my First-Aid Stick which contains Lavender Essential Oil! The oils in the lotions are high in Omega Fatty Acids which help heal and regenerate skin cells, and protect from aging and sun damage. My First-Aid Stick does all of those things and then some! It has extreme benefits for severe burns, and is wonderful for bug bites - another "gift" of summer!